I use drones to study groundwater. Groundwater is hidden in the soil and rock beneath our feet, but it makes up nearly 2% of the water on Earth -- over 5,000 times more water than is in rivers. Groundwater moves very slowly through the soil and the rock, but eventually flows into rivers or the ocean. Groundwater that flows into the ocean is referred to as submarine groundwater discharge (SGD). Because it flows through the ground en route to the ocean, groundwater picks up nutrients from the soil and rock. 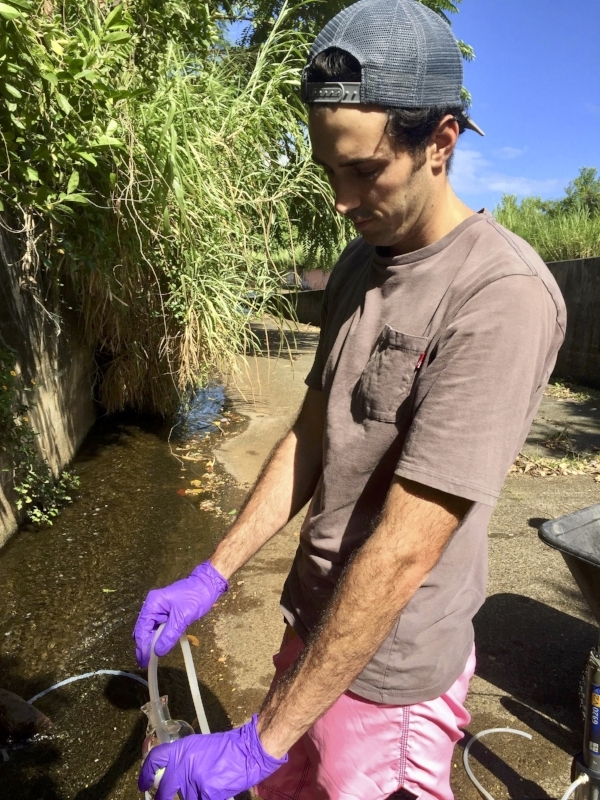 The ocean water around Hawai‘i is naturally nutrient-depleted, so submarine groundwater discharge provides a vital source of nutrients to the coastal ecosystem. Michael collecting ground water samples upriver. However, excess nutrients can cause invasive algae blooms and deplete coastal waters of oxygen, and human activities such as agriculture and waste disposal (e.g. cesspools) can add nutrients and other contaminants to groundwater. Because SGD flows from within the ground directly into the ocean, it is difficult to detect and measure. Most Hawaiian groundwater comes from rainfall at high elevations and remains buried beneath the surface, so it is colder than ocean water, which is continually heated by the sun. Measuring coastal water temperatures with UAS thermal infrared imaging allows easy detection of cold SGD entering the ocean. Live video from the infrared camera showing areas of hot and cold water from above. Because SGD is essential to Hawaiian coastal ecosystems, but a potential source of harmful contaminants, identifying locations of SGD is crucial for land-use planning and coastal resource management. Coral reefs are the rain forests of the ocean. They are home to a diverse array of marine animals, ranging from macrofauna such as sharks and turtles, down to the microscopic algae, bacteria, and coral polyps that literally build these immense structures, which, like the Great Barrier Reef, can even be seen from space. These living structures are vital to the ecologic and economic stability of countless town, cities, and even countries throughout the world. To learn more about why we need corals, I highly recommend watching Chasing Coral, which is free on Netflix. Unfortunately, coral reefs are in global decline. As a graduate student at the University of Hawaii, I tried to figure out why. The Hawaii Institute of Marine Biology. Kaneohe Bay, Oahu. While scientists have been studying coral reefs since the 1920's, field techniques have not advanced much in the past half century. Underwater surveys collect high resolution data of small areas, while remote sensing, using satellites of airplanes to collect imagery, can collect large areas of reef information at coarse spatial scales. However, there was no in between. How can we get the best of both worlds and collect high resolution reef data over large areas? With the right unmanned aerial systems, the proper airspace clearance, and a glassy day, we can fly at low altitudes to collect high resolution imagery of large coral reefs. An orthomosaic of a large (~55000 square meter) patch reef in Kaneohe Bay. Top left inset: magnified view of the orthomosaic, clearly showing coral colonies. Bottom right inset: Magnified satellite imagery of the same patch reef. Using some post processing and photogrammetry software, we can create images that give us colony level resolution over large reef areas. This information can help us understand how coral health changes across a reef. If we collect imagery of the same reef multiple times, we can see how the reef physically changes over time like never before. UAS imagery of two reef areas collected 9 months apart. Location 1: first row. Location 2: second row. We can see other critters too... The University of Hawaii and Hawaii Institute of Marine Biology are working to develop ways to better understand turle and whale populations using UAS. Honu (Turtle) takes a breath. As UAS technology progresses and becomes cheaper and more accessible to local communities, there is massive potential for citizen science initiatives, where schools or local communities that are concerned about their local marine resources can aid researchers in collecting data; essentially 'open sourcing previously specialized data collection methods. Coral reef decline, like almost all other environmental issues, will be the next generations problem to solve. Using new technology such as UAS, we have the potential to reinvent the way we collect, store, and share information about the natural world.